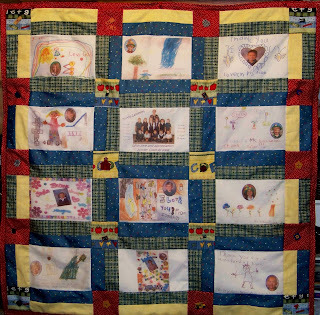 Dennis Doan Family: My First Quilt! 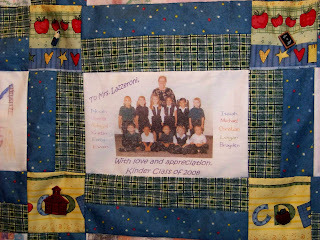 I just completed my first quilt and gave it as a gift to Logan's kinder teacher. She is so wonderful. I wanted to help the kids in his class, give her something from all of them at the end of the school year. I decided to do an art quilt and asked all the kids to draw a picture for Mrs. Lazzeroni. She loved it and I'm proud of pulling it off with out the surprise being told, especially with eleven five year olds! what an awesome and thoughtful thing to do for a teacher. she will treasure that forever!! good job quilting, too!! WOWZERS, Alicia....I'm impressed!! So cool! I love it! The whole idea is so sweet...and good job! Wow I am impressed and you did a great job. It is beautiful. "It's not snow! It's bubbles! What kind of sick trick is this! "It going to be mostly rainy with a lot of sun today. It will be officially windy." Hey, there's a crust (Crescent) moon tonight! The fringe on chaps are called bristles. "Daddy, you have enough hair on your face to make 5 bald men happy!" "Yeah, scared like a kid on a monsters head!" "Why did the lollypop cross the road? It was stuck to the chicken!"